The Russian electorate has received the answer to the question of who will be running for president in 2012. But the experts are definitely finding it difficult to assess the consequences of this decision by the tandem. “I’m carrying on working.” This was the note that appeared on Dmitry Medvedev’s Twitter account after the United Russia party congress at which he announced that he would not be running for president in 2012. The pundits following the proceedings immediately dubbed what had happened a “swap:” Medvedev proposed Prime Minister Vladimir Putin as a candidate for the post of president, and Putin, for his part, proposed that the current president take the post of prime minister. Immediately after the congress, Boris Nemtsov, one of the founders of the opposition People’s Freedom Party, called the swap “the worst scenario” for Russia’s political future. Political scientist Gleb Pavlovsky is sure that the decision announced at the ruling party’s congress was no surprise for those involved in the political process. “There was talk of this swap the whole of last year, from the moment when Putin started to put the pressure on and began lobbying for himself to be the candidate for 2012,” Pavlovsky said. Mikhail Remizov, president of the National Strategy Institute, thinks that the decision was driven by political necessity and in the long term “will increase the government’s stability.” This point of view is shared by a wide range of prominent Russian political scientists. But Alexei Makarkin, vice president of the Center for Political Technologies, does not agree with such an assessment. 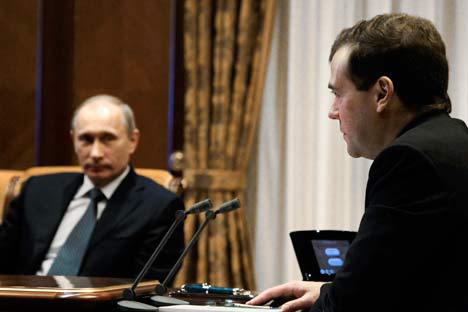 “As far as what Medvedev’s powers will be is concerned, I think they may be more extensive than those of prime ministers that we’ve had in the past,” he stated in an interview with business daily “Kommersant.” Makarkin predicts that the swap in the tandem may lead to the government being rejuvenated, and not just in the sense of portfolios being redistributed, but in the sense of truly “new blood” emerging.